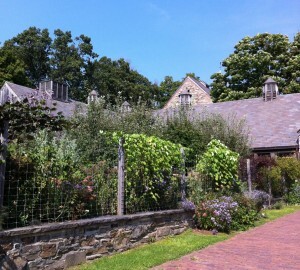 One recent Friday afternoon I decided to take a drive to Stone Barns to have a little lunch and walk around the farm. On Thursday and Friday they have a small Farmers Market set up near the Cafe, so after lunch a meandered over to see what they had. 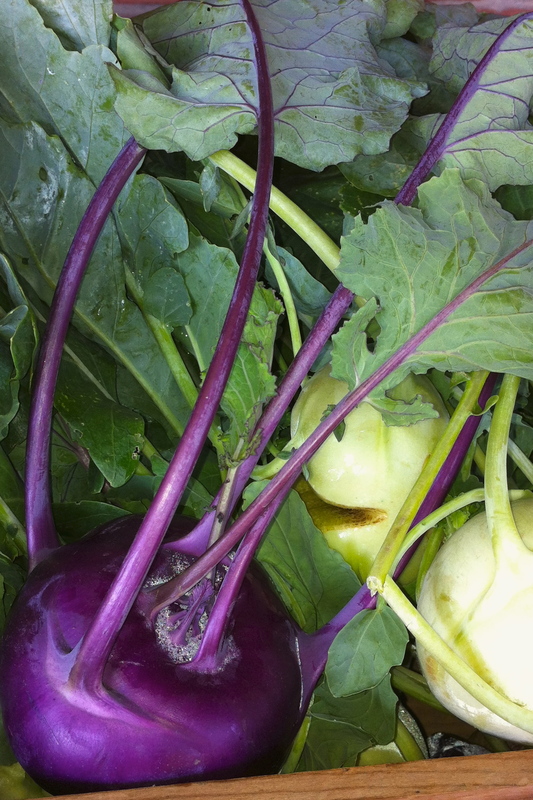 Kohlrabi: it’s a member of the cabbage family with a mild flavor similar to broccoli. I actually think it’s quite pretty. The little stout bulbs have lovely long stems that are topped with beautiful leaves, colored in shades of purple and green. It’s hard to tell exactly when and where this vegetable made it’s first appearance, but it seems that by 1600 it made it’s way to India and became a staple crop. We then see mention of it in the U.S. around 1800. The entire kohlrabi plant can be eaten raw or cooked – making it very versatile and easy to cook. Monday and Tuesdays are personal chef cooking work days for me. I typically start at 9:00 and finish in the early evening. By Tuesday night I’m pretty much either looking for take-out (yes, I’m admitting that to you!) or making something that is very simple for Larry and I to have for dinner. Earlier that day I was picking up the fish at Port Chester Seafood for one of my clients and noticed a container of lump crab in the case. 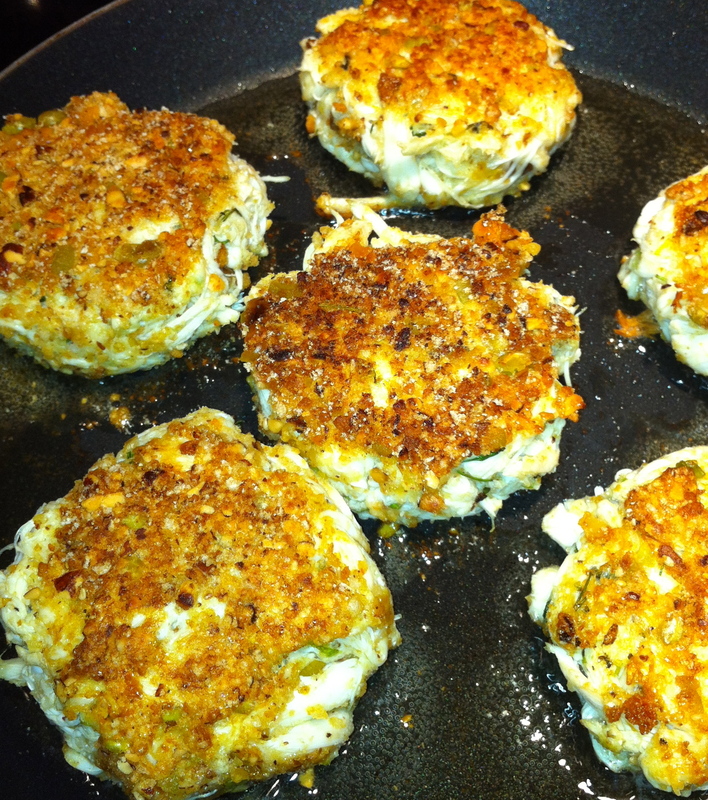 Larry and I are big fans of crab cakes and I’m always experimenting with various seasonings in them. After I got home I decided to check my email before starting dinner and headed up to my office. Sitting on my desk I have a bag of Asian Trail Mix that I graze on when I’m feeling a little peckish. There was my inspiration! After getting through my messages and then seeing a text that Larry was on the train coming home I high-tailed it back to the kitchen to get dinner ready. 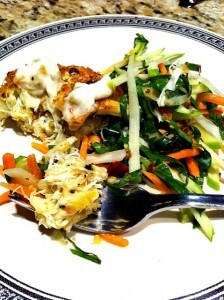 As the crab cake idea was forming in my head I knew I was going to use my kohlrabi as part of the slaw. First things first … the crab cake. 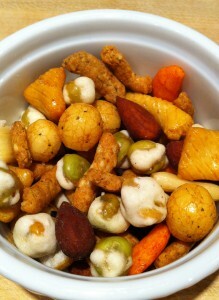 I took the trail mix and gave it a whirl in my mini-food processor. That would be the crust. 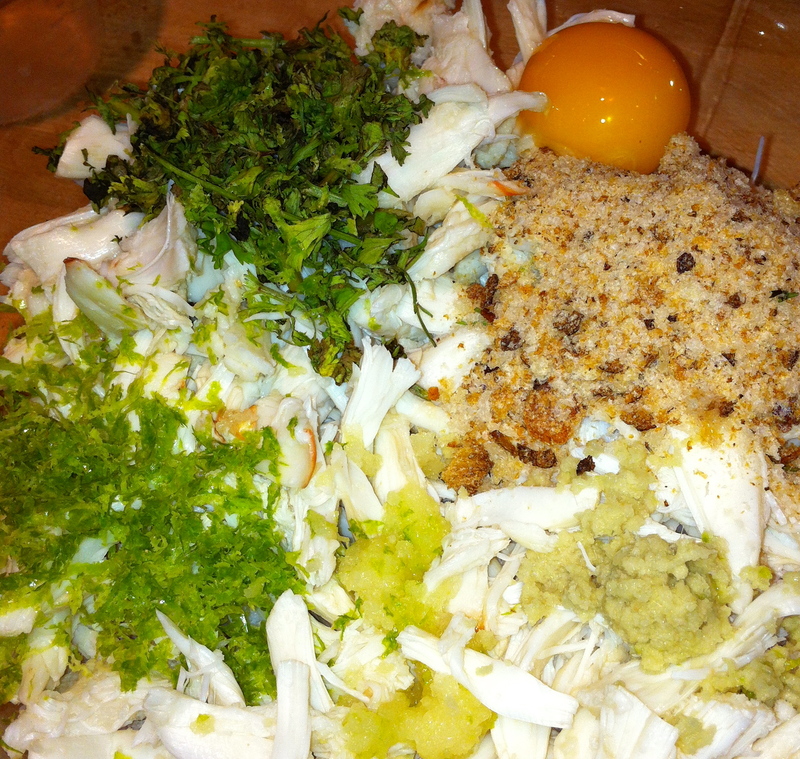 After draining the crab and picking though for shells I started adding things for flavor: cilantro, garlic, ginger … the binder was egg and fresh breadcrumbs. 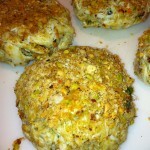 After a quick dip in a little egg white and the crushed trail mix my little crab cakes were done. Turning my attention to the slaw I pulled out my handy mandoline slicer, which is seriously the best gadget ever, and got to work. I added a little green apple, the kohlrabi leaves and shredded carrot for color to my slaw. While I was cooking the crab cakes I let the slaw hang out for a few minutes in a lemon-water bath. This helps keep it all from turning brown; looking nice and fresh. 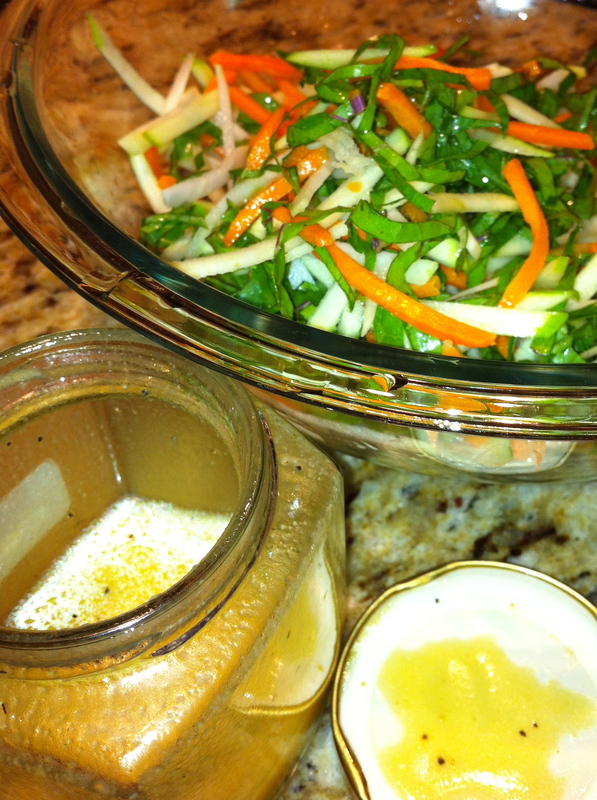 The dressing for the slaw is just a simple honey-dijon vinaigrette. You can use white wine vinegar but since I had the other half of the lemon, that was my acid. Make life easy on yourself and just pop it all into a little glass jar and shake. 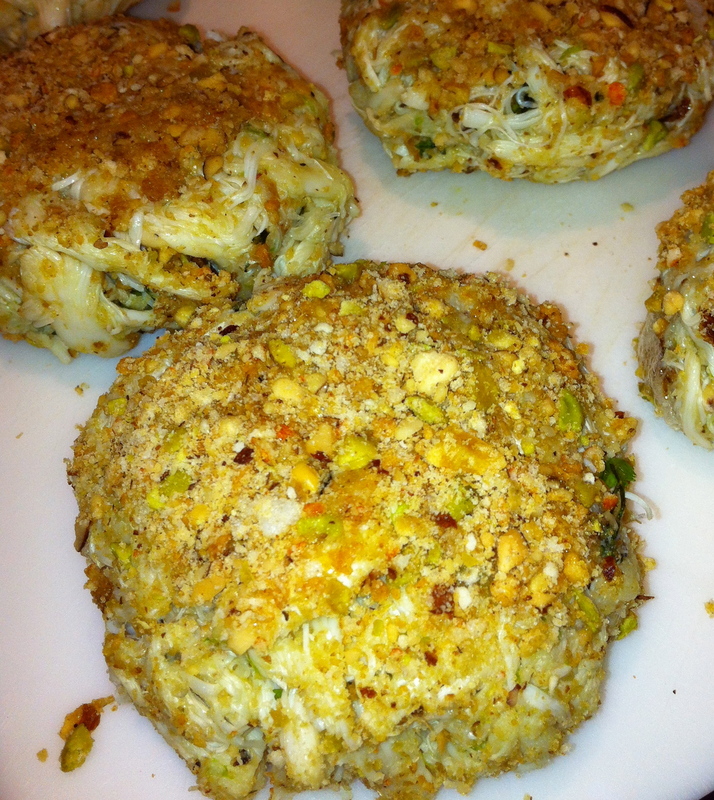 The crab cakes were done and the slaw ready to toss … but looking at it all I realized I needed a little remoulade for the cakes … turning my attention back to the trail mix bag I pulled out some of the wasabi peas and crushed them. Adding the peas, cilantro, lime juice (from a remaining half), salt and pepper to mayonnaise did the trick. While I was digging around for the peas I also grabbed some of the tamari almonds and gave them a little crush as well to finish the dish. If you have a mandoline this will all come together in less that 40 minutes. 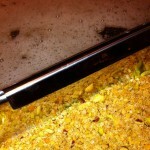 The shredding attachment on a food processor will also work, but the cuts will be much smaller. 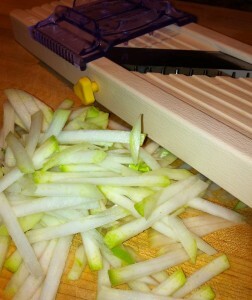 My suggestion would be to go the traditional way and slice the apple and kohlrabi with a very sharp knife. The carrots can be purchase shredded at the grocery store. If you are out and about today stop by the Farmers Market at PepsiCo, around lunch time. I will be demoing this tasty slaw! Also, this coming Friday, September 28, I will be participating in a ground breaking conference on weight loss and obesity. While the conference is geared to practitioners it is open to the community. They will be discussing various types of approaches to these issues through diet, exercise, medication and every day practical tools like smart-phone apps and cooking techniques (by me!) The woman who is spearheading this conference, Dr. Harriette Mogul, wrote a best-seller about woman struggling with mid-life weight gain and a two-pronged approach to help correct it. The book is called Syndrome W, A Woman’s Guide to Reversing Midlife Weight Gain. It’s a fantastic book (which I’ve read) and a must-read for any woman in her 40’s-60’s! It’s going to be a very informative conference. For details on the conference and registration click the link. 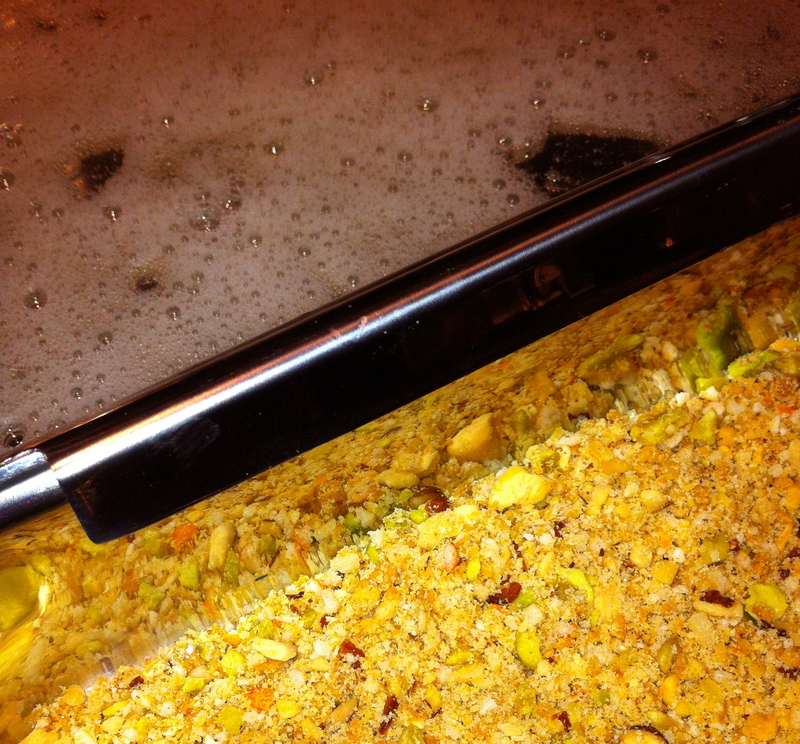 Place the Asian trail mix in a mini-food processor and process until finely ground. Set aside. In a large mixing bowl combine the crab, cilantro, garlic, ginger, lime, breadcrumbs, egg, 1 teaspoon of salt and 1/2 teaspoon of black pepper. Mix gently until all the ingredients are incorporated and form into 6 patties. 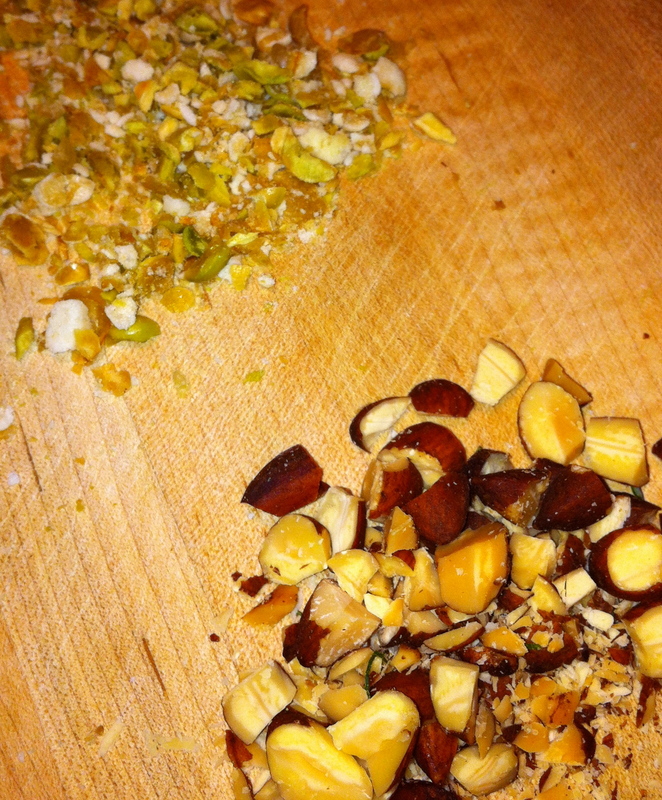 In two separate containers place the trail mix crumbs and the egg white, slightly beaten. 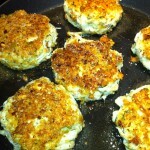 Dip both sides of the the crab cake in the egg white and then the crumbs and set on a cutting board. Heat 1-2 tablespoons of grapeseed oil in a shallow non-stick pan over medium high heat. Brown the cakes for about 2-3 minutes on each side. Remove to a paper-towel lined plate and set in a warm oven until you are ready to serve. Serve with the remoulade and slaw. Combine all ingredients in a bowl and taste for seasoning. 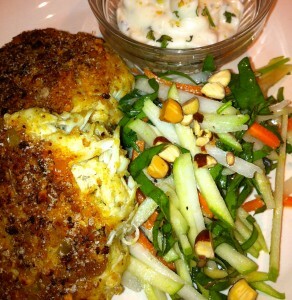 Serve with Asian-inspired Crab Cakes. 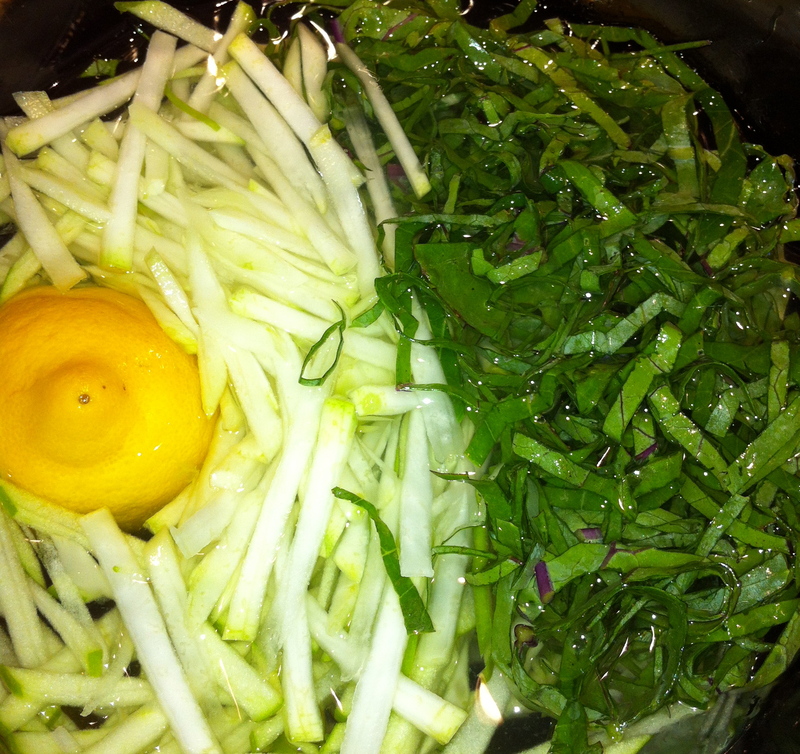 Place the vegetables and leaves in a large bowl with cold water and 1/2 lemon, and set aside. 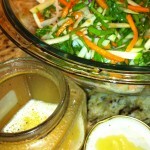 In a small glass jar combine the oil, vinegar, honey and dijon, and shake well. Add salt and pepper to taste and shake. Drain the slaw ingredients and dress with vinaigrette. 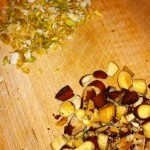 Serve immediately topped with the almonds. 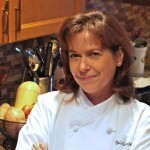 Maria Reina is a personal chef, caterer and recreational cooking class teacher in Port Chester, NY. In her free time she loves hanging out at local Farmers Markets in Westchester County doing cooking demos with seasonal ingredients. In addition to her blog you can follow her on Facebook and Twitter. Previous ArticleWhat? A Bacon Shortage? Next Article I Eat Plants: Try this Creamy Kale Miso Soup at the John Jay Homestead Farm Market Saturday!